What exactly is a turret? Simply put, a turret is a small tower that projects from a building or structure. We know you are probably thinking "Do they mean a castle?" The answer is yes! Turrets were originally used on medieval castles to provide the inhabitants with a good defensive position should the need arise. As military defenses became less necessary, turrets were created for decorative purposes like the ones we see on homes today. 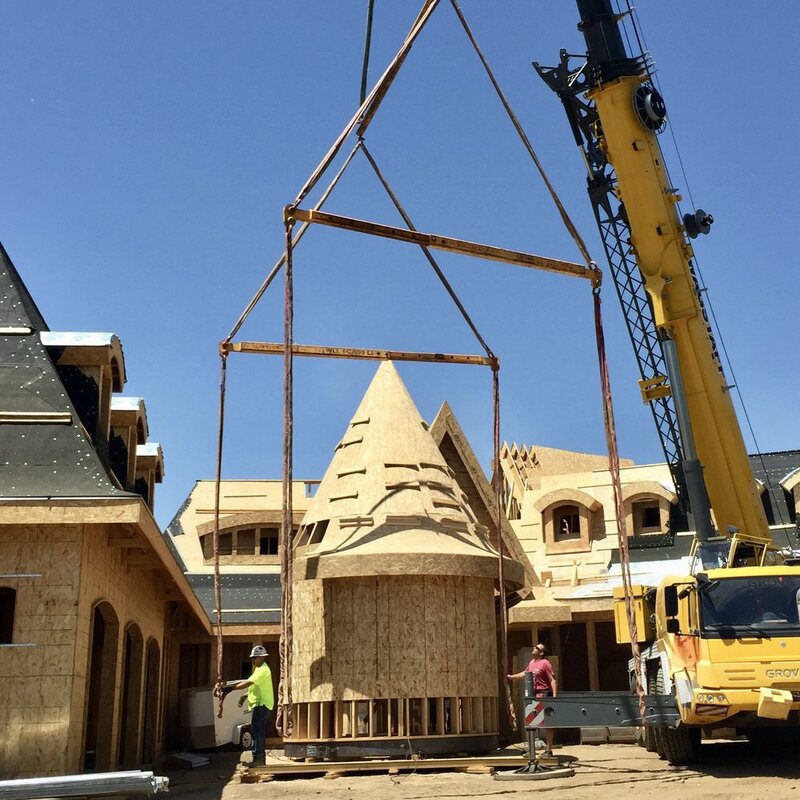 Our French Revival Project has several turrets in various sizes, but today we thought we'd share about the largest one and how it all came together. We love all the curves and arches that are interspersed throughout the home, but just beyond this amazing covered front entrance is one of our favorite details—a turret that is both commanding and lovely. The perfectly curved walls are nothing short of beautiful in our opinion! This extra-large turret was built on a platform in front of the home as "bending" the wood is a more complicated type of framework. The hours spent getting it just right was well worth the effort! Moving day! Now with a roof, the turret is ready to be placed. A handful of workers spent several hours carefully moving the bulky framed piece, finishing just before sundown . . .
We had just enough time to take a shot before the light disappeared altogether. It turned out just as we had imagined—if not better—and looks perfect nestled in next to the grand front entrance. And, if you were wondering, this is what the turret looks like from the inside! All that framework and the time and effort that was put into it really takes our breath away. And finally, here's a first look at the front elevation of this fabulous home. It really is a gorgeous and unique project that we are so happy to be working on. As we've said before, we really do have the best clients in the world! Hello! Welcome to the Oviatt Design Group blog! We love every aspect of design and are so excited to share what inspires us. Finding a design you will truly love is both exciting and overwhelming at times, but it's our goal to help you feel happy and confident in your design choices while creating your own personal haven at home. Finding the perfect balance between style and comfort is possible, and when you have the best clients in the world like we do, it makes our job pretty easy getting there!